In honour of Mother's Day – which is celebrated in May in the USA and Canada - four women, considered to be exceptional mothers, were invited to discuss motherhood on the popular Professor Gerry Cammy Show on Canada's national talk radio. 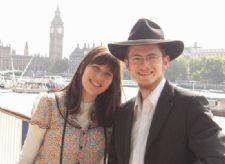 Among them were Devora Caytak, a mother of twelve from Ottawa, and her daughter, Sara Loewenthal , co-director of Chabad of South Kensington in London. Devora Caytak doesn't just confine herself to being a full-time mother of twelve. Rather, she is an integral part of Ottawa's Jewish community, busy running the city's Camp Gan Israel, a Montessori Jewish preschool, friendship circle and Jewish youth library. "I see it as my duty to mould good citizens. I always pray for insight in fulfilling my responsibilities to my children," said Caytak. Sara Loewenthal spoke about how time is the most important gift that a parent can give to a child. "My mother always makes sure to spend time with all twelve of us despite being so busy. I always remember spending quality and special time with her," said Loewenthal. "Even though I'm now in London, we speak every day, and she gives me a great amount of encouragement." In her role as co-director of Chabad of South Kensington, Loewenthal takes much inspiration from her parent'’ philosophy of having an open house. Asked what she learned from her mother, she responded "the blessing of community involvement," explaining how she had recently made Passover seders and meals for over 150 people.